In this semester, Lab Meeting will be held to share the knowledge of each student/researcher. All students and researchers in our laboratory are expected to attend this meeting. In this semester, we don't have presentation on research progress. I would like all presenters to introduce a scientific paper. 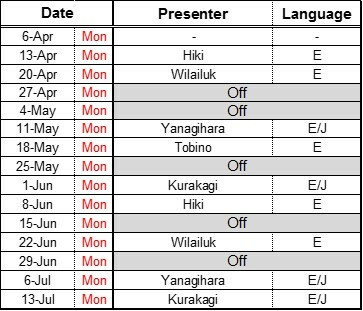 The schedule is shown in the following table. Hasenbein M. et al., 2014, Transcriptomic profiling permits the identification of pollutant sources and effects in ambient water samples, Sci. Total Environ., 468-469, 688-698. Kemble N.E., 1999, Tolerance of freshwater test organisms to formulated sediments for use as control materials in whole-sediment toxicity tests, ETC, 18(2), 222-230. Maity S. et al., 2013, Elucidating causes of Diporeia decline in the Great Lakes via metabolomics: Physiological responses after exposure to different stressors, Physiol. Biochem. Zool., 86(2), 213-223. Sison-MAngus M.P. et al., 2015, Water fleas require microbiota for survival, growth and reproduction, ISME J, 9, 59-67. Lou T. and Xie H., 2006, Photochemical alteration of the molecular weight of dissolved organic matter, 2006, Chemosphere, 65, 2333-2342. Scott C.P. et al., 2009, The effect of genetic and environmental variation on metabolic gene expression, Mol. Ecol., 18, 2832-2843. 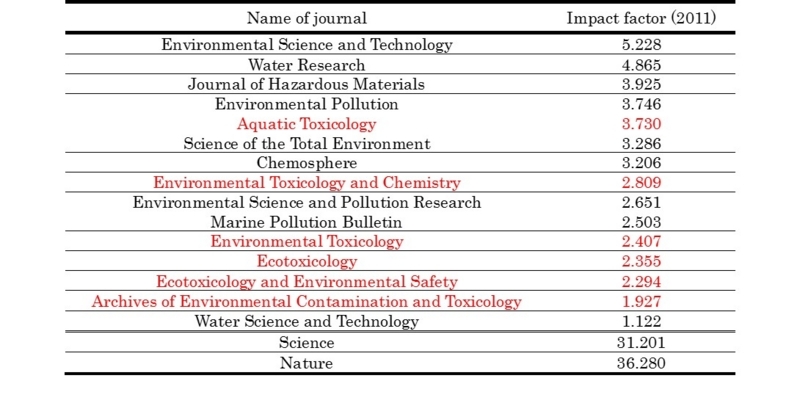 Pane E.F., Smith C., McGeer J.C. and Wood C.M., 2003, Mechanisms of acute and chronic waterborne nickel toxicity in the freshwater cladoceran, Daphnia magna, Environmen. Sci. Technol., 37(19), 4382-4389. Li X.Y. and Chu H.P., 2003, Membrane bioreactor for the drinking water treatment of polluted surface water supplies, Water Res., 37(19), 4781-4791. Leonard J.A., Cope W.G., Barnhart M.C. and Bringolf R.B., 2014, Metabolomic, behavioral, and reproductive effects of the synthetic estrogen 17 α-ethinylestradiol on the unionid mussel Lampsilis fasciola, Aquatic Toxicol., 150, 103-116. Yang R. and Van Den Berg C.M., 2009, Metal complexation by humic substances in seawater, Environ. Sci. Technol., 43(19), 7192-7197.